This microfine pigment is a slight variation on PG7. While it retains the brilliance of an organic manufactured pigment, the micronized pigment has a dark pine tree shade. Suitable for all media including fresco and cement. High tinting strength and low opacity. Q: This is pg7, not some other color index number? (I'm a little confused by "imitation pg7". ) When mixed with white, does it have the distinctive electric green of a typical pg7, or is it more subdued? Also, are there any challenges to mixing a micronized pigment with oil? Thanks! 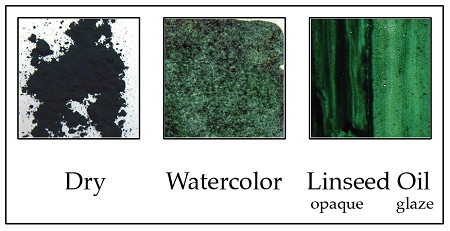 A: The original Sap Green was an organic fugitive pigment, hence the "imitation" designation. This is an organic manufactured pigment, classified as PG7 and therefore has an "electric green" effect when mixed with white. The micronized pigment integrates nicely into oil.